One of the things on my summer bucket list is to cook once per week out of a cook book. Cooking a meal out of a cookbook—what a concept, right?! But in this era of technology that we are in, sometimes it feels like there is no need to pick up a physical cook book when you have thousands of other recipes at the disposal of your fingertips. Well, that changed once I got What’s Gaby Cooking cookbook in the mail a few weeks ago and saw all of the yummy recipes. Reading through the cookbook and seeing all the beautiful dishes, I felt inspired to try new recipes and be more adventurous this summer when cooking. So for the next few months, I am going to try to share a recipe per week with you all from a cookbook (a ton will probably be from What’s Gaby Cooking but I’ll try to mix it up). Okay, one last thing before I get to the recipe. This salad is SO good. The chicken marinade is so tasty and the mix of sweet and salty flavors is verryyyyy nice (said in Borat voice). Like, I am mildly obsessed and want to make again ASAP. I love everything about it…except the dressing. I wasn’t a huge fan of the homemade dressing. I ate the salad as leftovers and used Trader Joe’s Onion Bacon Vinaigrette dressing and it was DELICIOUS! And it was clearly much easier :). *I steam my ears of corn using this nifty contraption – fill halfway with water and microwave for 4-5 minutes. I microwave one ear at a time. Marinate chicken: Mix chicken marinade ingredients together in a large ziplock bag. Add in chicken tenders and toss to coat. Let marinate in fridge for at least an hour or up to 12 hours. 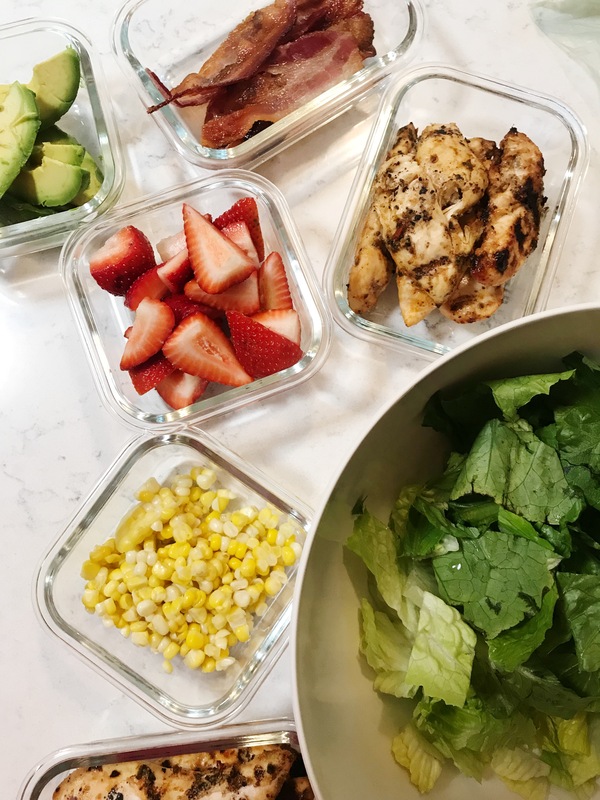 Assemble salad – layer romaine, corn, bacon, strawberries, avocado , & chicken. Add dressing and toss to combine.